Planning a Corporate Event This Winter? months, outdoor venues such as parks offer the opportunity to escape outside for rustic Barbies, elegant picnics or fun and games in the sun. In the winter time, things are a little different. Activities are more limited and in the absents of being in Mother Nature’s wonder, you are pretty much limited to the decorations you bring yourself or those provided by the venue itself. In short, when the weather turns cold, a corporate event has to have two stars to be a success; the venue and the menu, with a special emphasis on the later. 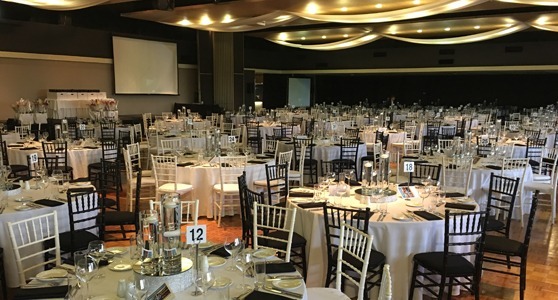 Depending on the size of your gathering, of course, the main things to remember when choosing your event location are flexibility and accessibility. No one wants to have to wander around the streets trying to figure out where they are supposed to be or have to follow a three page set of directions trying to find where they are going to finally get dinner. Your event location should be easy to find, easy to get to, for both those driving and not. Another common issue that often arises for those tasked with planning an event is when the programme or guest list suddenly changes. Does your chosen venue offer rooms of differing sizes and configurations? If THE BOSS suddenly decides they want 25 guests instead of the originally planned 5 can the corporate venue accommodate you in a larger room or if half the guests get snowed in somewhere, can the room be downsized to maintain an intimate feeling? If you want people to look forward to your events and management to be proud of them, then you need to be original and offer some variety in the menu. Try something new like Greek or Mediterranean Food. All the ingredients are familiar, so the guest won’t feel like they are playing Fear Factor, but they will be prepared in new and exciting ways that will stretch your guest imaginations, just enough, to make it exciting and for the health conscious there will be plenty of options that aren’t just another bland meal. For the person tasked with planning, corporate events it is always a struggle to be original and have their guest be excited about attending. The secret to this, especially in the colder months of the year, when activities are by necessity limited, has got to be the food. No one ever walked away from an excellent meal without a smile on their face and a thank you in their hearts. So, remember your audience find a flexible venue and present an excellent meal original enough to be exciting and familiar enough for comfort and you will be well on your way to hosting a company event that will be both memorable and appreciated by all concerned.